In 2007 or so I had heard about Invicta Sunday Run. I was boggled by the fact that you could get an apparently Swiss Made watch for rock bottom prices. At the time I still didn’t want to plunk down any money on a watch, so to the back of my head went the fantasy. Fast Forward 7 years and I find myself wanting to scoop up an automatic watch. 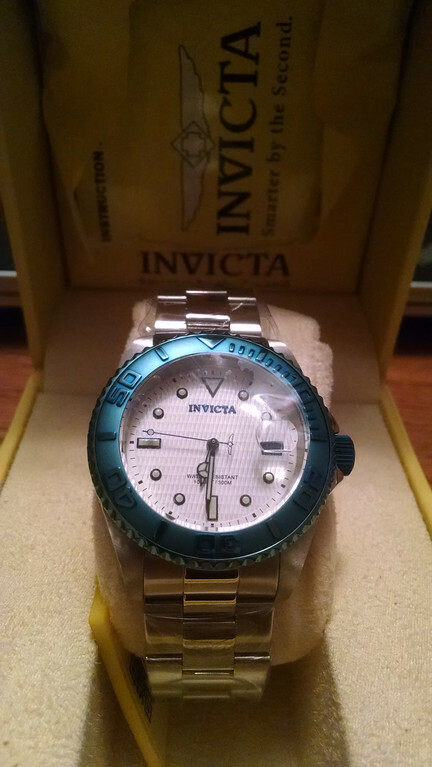 By now I knew that while the Invicta’s were nothing to rave about and by the look of most….a bit gaudy or over the top, I still wanted one. At the sub $100 buy-in, I figured worst case I’ve got some auto beater and that’d be that. 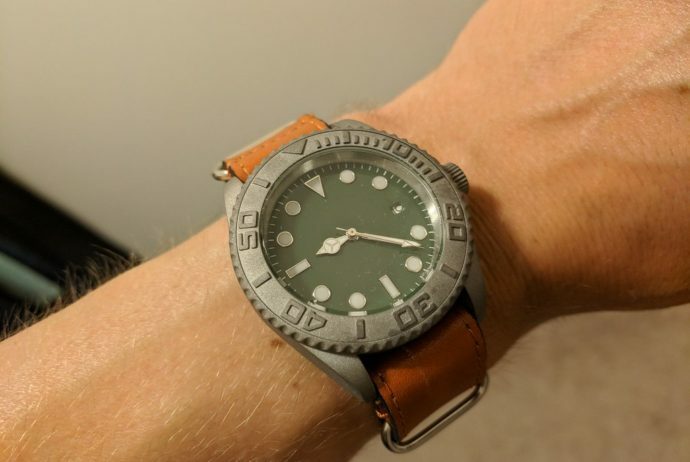 Enter my 12385 Pro Diver. An interesting off color blue bezel & crown with well, let the images state the obvious. All wasn’t or isn’t really bad with the Invicta. 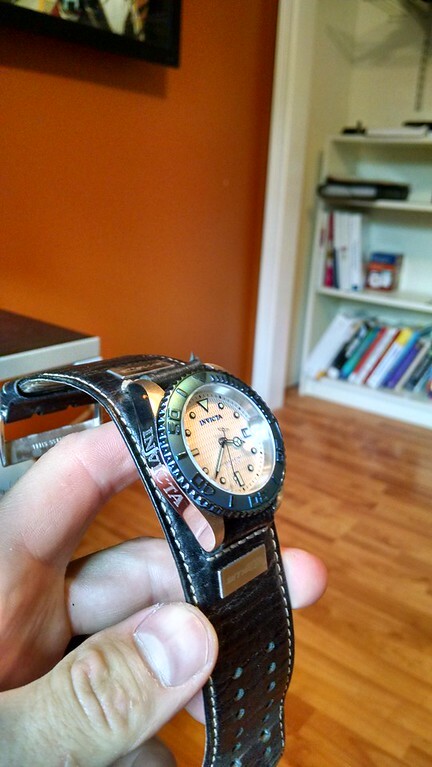 Yah, the strap sucked especially given it had hollow end links, but the heart of the beast is a Seiko NH35 which has kept impeccable time. The time has been been consistent despite the fact that I have literally chucked this thing across a skatepark, with it landing on concrete after the springbars failed. 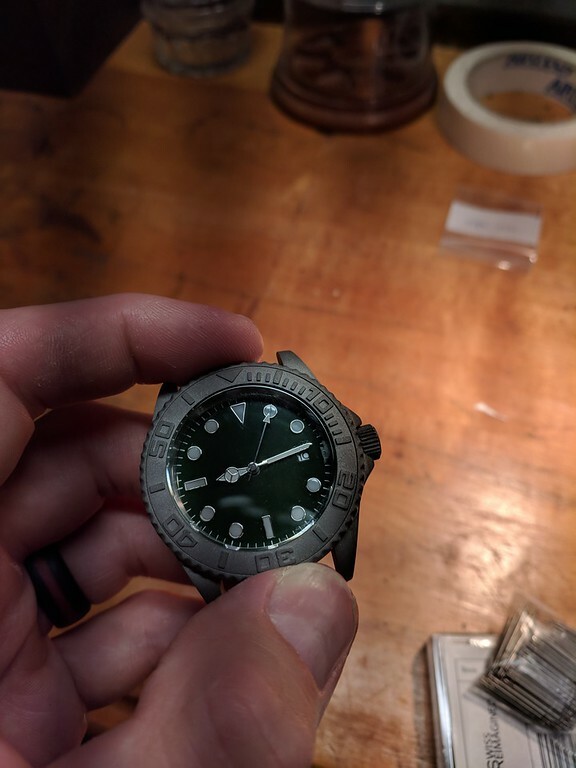 This failure led me to trying a handful of configurations as I quickly realized that in its stock form, this was anything but an ideal daily wear watch for myself. I tried alternate straps, but still the emblazoned INVICTA logo and mismatch strap just wasn’t working for me. I even printed a watch molder to mount the Invicta to my motorcycle. It worked, but still did not seem right. 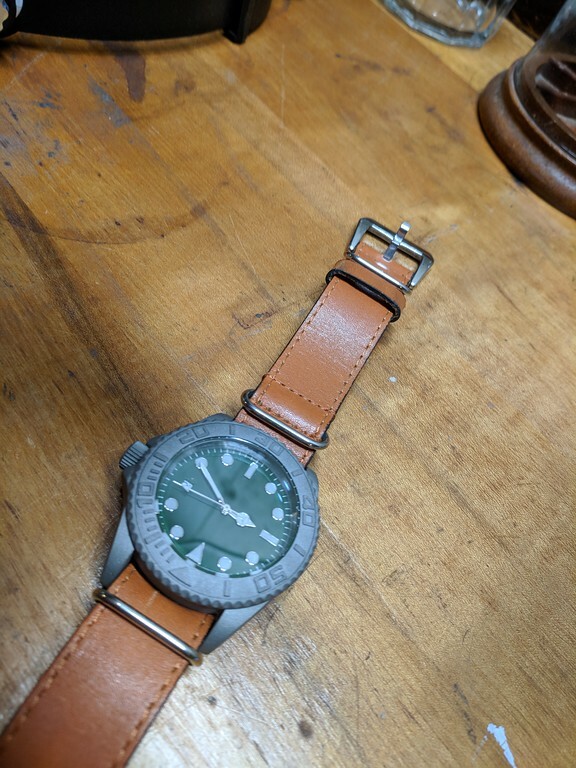 With a pile of straps tested and still not feeling right with this watch, it was banished to somewhere in my sock drawer. Too cheap to resell, but still something about it kept drawing me back. Winter of 2015 I was living with my in-laws, while all my garage & technical possessions were nestled a few miles away in my parents basement. What was also nestled in their basement was my great-grandfathers watchmakers bench. Something I had looked at since early childhood. I will post more on this later, but it was there as I was contemplating life that I knew I had to get to my family roots and do something with my watches. The Invicta was the perfect choice to start out with, as I knew I essentially had nothing to lose. My plan was a simple, with little overall plan other than “modify to improve looks”. When you’re at the bottom, your only way is up, so off I set about to disassemble and gain access to the case itself. Out came the inners, and off I went to the shop. Taking shape, though that cyclops is unsightly. From here, the watch sat for nearly 3 years. I moved and then from there brought my first child to the world. I decided finally the finish and buckle down. It was then that I realized pretty much no one makes a dial to properly fit. Dial posts in the wrong location, and on top of that, date window not in the right location. I’d hoped some other dials would work, but it just wasn’t to be. I then found myself a dial on ebay straight from China. I had intended to continue with a red\black theme I generally do, but the green dial spoke to me. 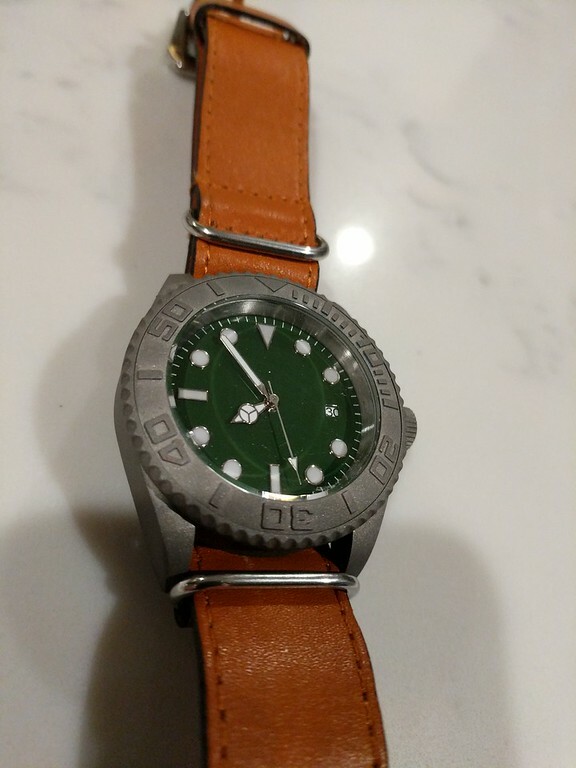 I’ve never had a green dial watch, so I thought I’d give it a go. Unfortunately, the dial feet don’t match with the watch, nor does the date window line up perfectly, but I figured I’d roll with it. 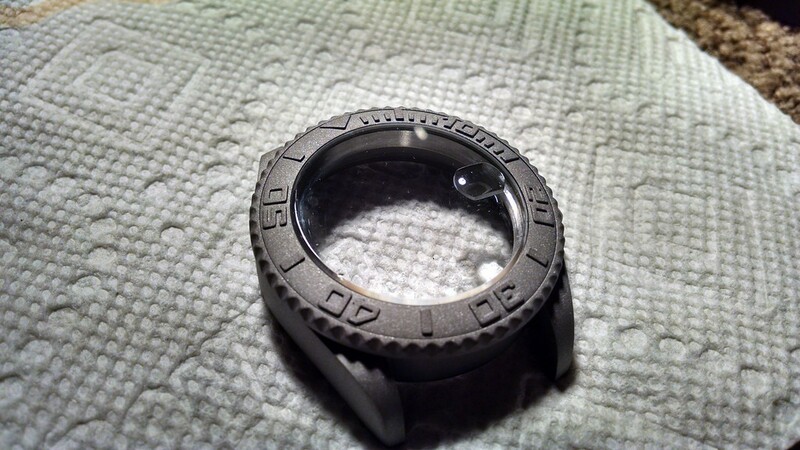 I clipped the feet, sanded the backside and found some info on adhering the dial to the movement. Things were starting to take shape. I should note somewhere along the way that I torched the glass and removed the cyclops……..mucho bettero. And with that, things began to take shape very quickly. With the first time wearing the watch, I realized I had a problem. I hadn’t noticed during assembly, but it seemed the time was skipping. 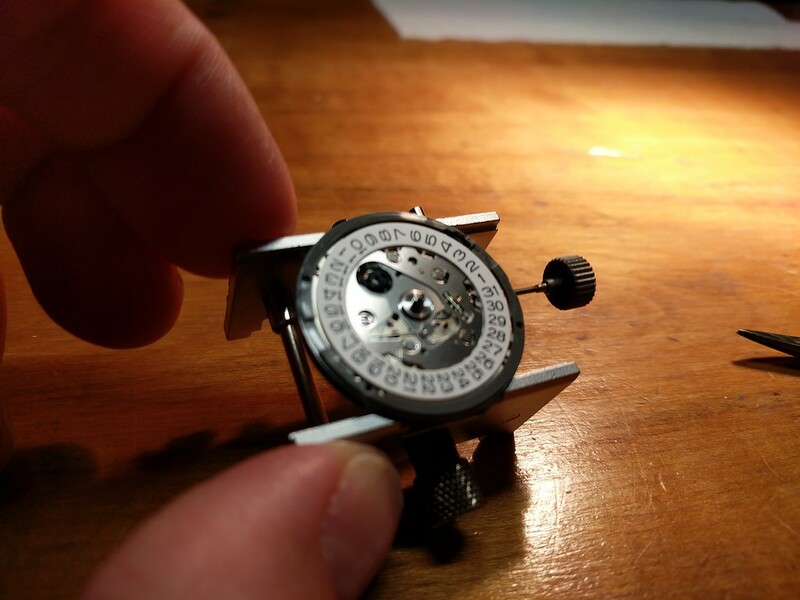 I assumed I hadn’t hit some time warp with this watch and found that the minute hand shaft on the movement was slightly undersized from the hands I had purchased. I proved this theory when I tried a second set of hands with the same issue. Frustrating, but I quickly realized that I could fix this with a staking tool I have. A real quick press of consecutively smaller punches and I had the ID where I needed it to be to work. Another reminder to be slow and methodical. 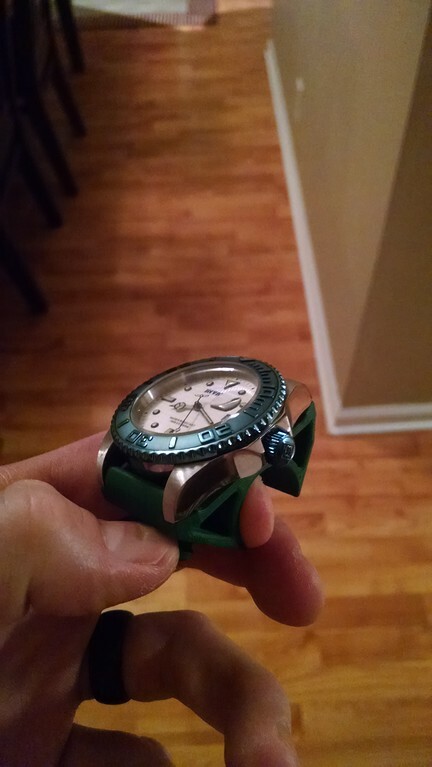 I’ll have to snag some new pictures, but I am really enjoying this newly modified watch. It was far more straight forward than i was planning, but there are many details that I feel are needing to be addressed, though I’m not going to. I feel these will be a good reminder of things to fix. The hands are not perfectly flat. The glass has some issues from when I sand blasted the case. The strap I’m not thrilled with. 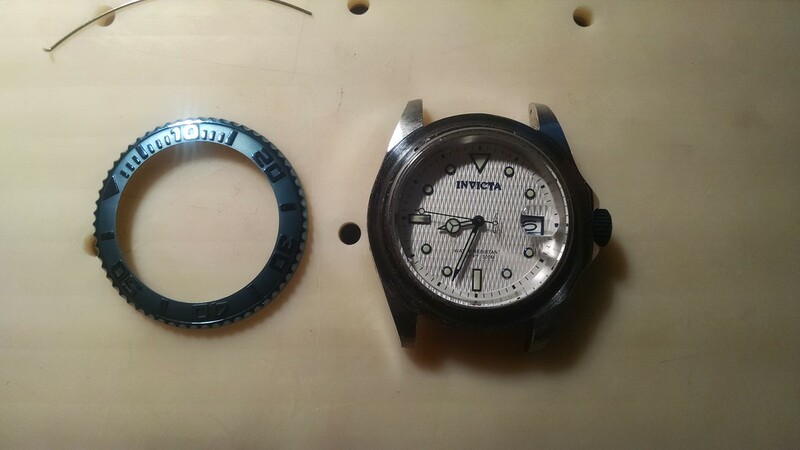 The weight still has Invicta branding on it, which I still am going to modify and laser with something new. A couple other things, but as a whole, it’s exciting having something that no one else will ever have. It’s a cheap watch, but one to forever be in the collection. Andrew Side note – Hands were purchased from Ofrei and the dial from eBay. 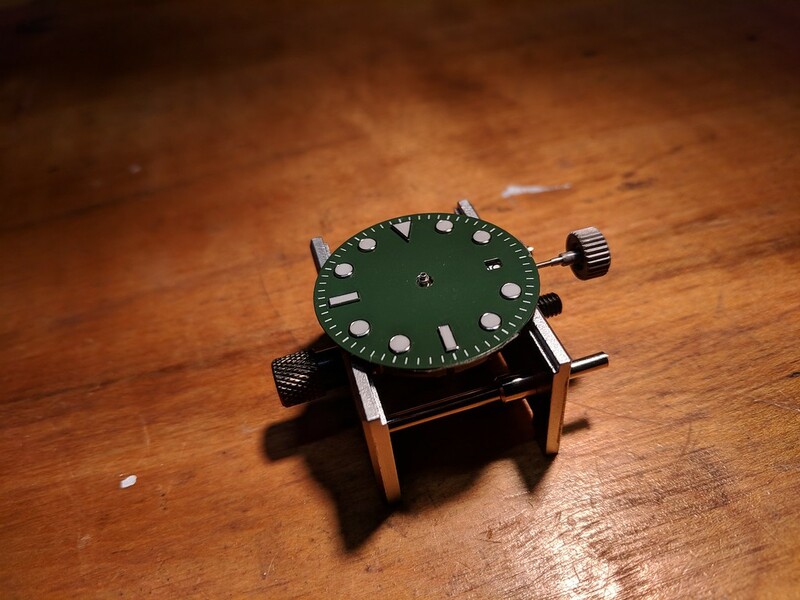 I used 0.005″ thick double sided tape to adhere the dial to the movement.